Healthy gardenias have fragrant white flowers and beautiful, bright green leaves. However, there are numerous diseases that can turn even the most beautiful and healthy gardenia into a dead or dying plant. Some gardenia diseases are caused by bacteria; others are caused by some type of fungus, and still other gardenia diseases are caused by insects. The majority of gardenia diseases can be treated and cured, but some are fatal. Insects are one of the biggest problems when growing gardenia plants. Aphids, mealybugs, whiteflies, and scales are just four of the many insects that attack gardenias. Mealybugs are the most common insects that attack gardenia plants. These insects can be identified by the white, cottony mass on the various protected areas of the plant, like the underside of the leaves. Aphids also live on the underside of the leaves. They can be identified by their tear-shaped bodies and the fact that they cluster together in groups. Bacterial leaf spot is evidenced by small, round spots on tender, young leaves. As the leaves get bigger, the spots turn yellow and then reddish-brown. A severe bacterial leaf spot infection will cause the leaves of the gardenia plant to eventually fall off. Avoid getting water on the leaves. as this will cause the bacteria to spread to other plants. Fungal diseases are a major problem with gardenia plants. Canker is one of the most common fungal diseases that affect gardenia plants. A gardenia plant infected by the canker fungus will have a swollen stem at or just below the soil line. The bark of the gardenia plant will appear corky and have longitudinal cracks around the swollen part of the plant. Canker cannot be treated successfully. 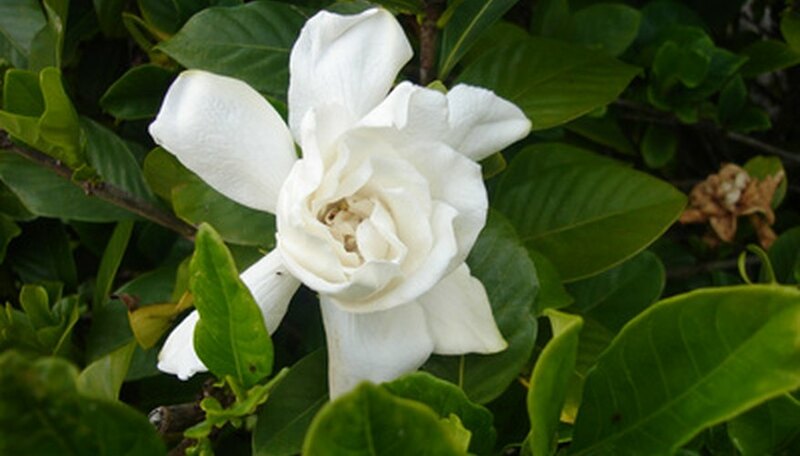 The gardenia plant must be carefully dug up and destroyed to prevent the disease from spreading. Three common leaf spot diseases that affect gardenia plants are Rhizoctonia spp., Cercospora spp., and Phyllosticta spp., which all share the same main characteristics. Fungal leaf spot appears as brown spots, sometimes with yellow halos around them, on the leaves of gardenia plants. The spots are circular but vary in size. The older leaves are often the first to be affected because of overcrowding of the larger, older leaves. Remove infected leaves from the gardenia plant and destroy the leaves. Spraying the gardenia plant with a folial fungicide can control the spread of leaf spot when used regularly. Sooty mold and powdery mildew are fungal diseases that are also common on gardenia plants. Powdery mildew is evidenced by white, powdery spots on the gardenia plant's leaves that occur most often during seasons with cool nights and warm days. Finally, sooty mold forms on the top part of the leaf. It is caused by a fungus that attaches itself to the sugary excretions left behind by white flies. Using a fungicidal soap will temporarily get rid of the fungus, but the best prevention is to control the white fly population.